At the heart of Vrboska is one of the more unusual churches that you’ll ever see – the church fortress of St Mary of Mercy has high walls, battlements and an impressive ravelin defending the front door. Originally financed by the local people, it was extended and fortified in 1575 to be a refuge in times of attack by the Ottoman Turks and other marauding pirates. 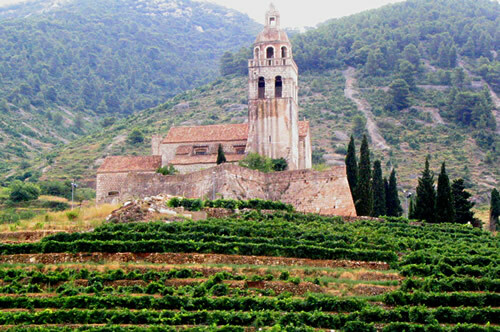 Another St Mary’s is the dominating church in Jelsa, with its elegant white bell-tower standing proudly above the cluster of red roofs. This church gets a mention in the Hvar Statute of 1331, at a time when it was much smaller. Don’t let the 19th century façade and bell-tower fool you – take a peek round the back and you’ll see high defensive walls with battlements. This church was also a place of refuge for the local townsfolk in the 16th century when the Turks came calling. 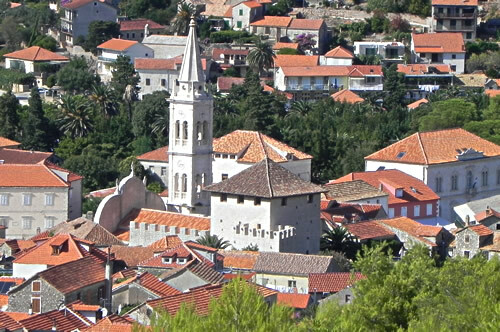 And over in Stari Grad, the Dominican Monastery of St Peter the Martyr was founded in 1482. Following a devastating attack by Turkish corsair Uluj Ali in 1571, much of the town had to be rebuilt, and the monastery added a defensive tower. Local people here also had the option of sheltering in Tvrdalj, the fortified summer residence of Petar Hektorovic. Pity it wasn’t quite finished ready for the attack! 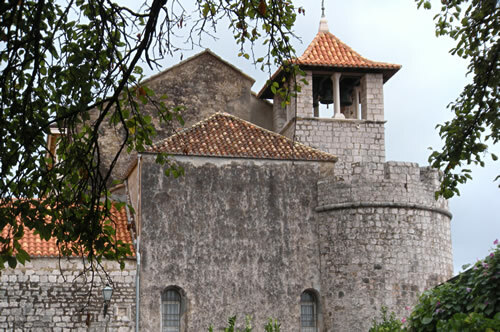 These days the monastery has a lovely museum, displaying some of the rich heritage of this most ancient of Hvar’s towns. So what is the difference between a fortified church and a church-fortress? And how widespread are they? 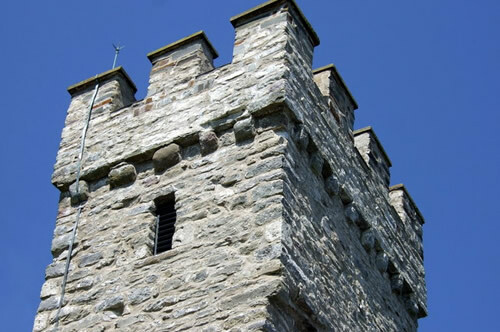 A fortified church is a church designed to play a defensive role in time of conflict, incorporating military features such as thick walls, battlements, and embrasures. A fortress church is specific type of fortified church that is also used by the local population as a retreat and defensive position. A fortress church usually has a complex of buildings set within a surrounding defensive wall. 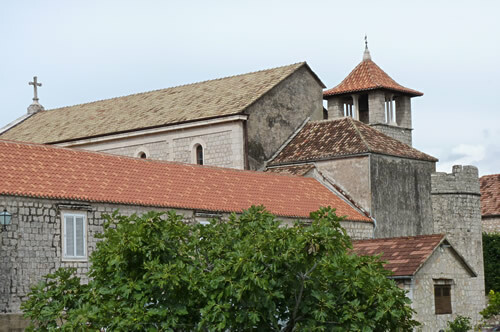 In the case of St Mary’s in Vrboska, there is only the church itself, no other related buildings or surrounding wall, but it was definitely designed as a refuge for the locals in time of attack. 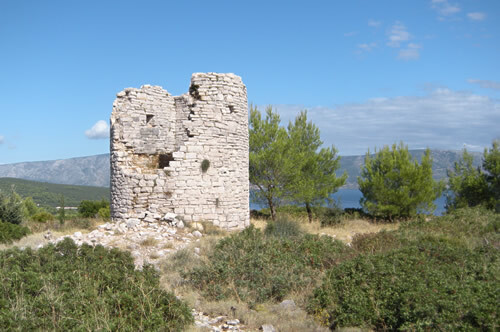 Also, there is a 16th century look-out tower – known as Kaštilac – on top of the hill to the north, which gets a great view over the sea approaches. So, not a defensive tower, but an important watch-tower. Unlike continental warfare, there would be no reason to fend off an enemy for weeks on end, as a prolonged siege was unlikely. Pirate ships would sail in for a quick raid, taking what they could in the way of slaves and other loot, and burning the rest. So a church fortress here may not have needed additional enclosing walls, as it might have on mainland Europe. Incidently, pirate boats from Makarska still raid amongst the islands, but the worst part of the attack these days is that truly awful booming music! 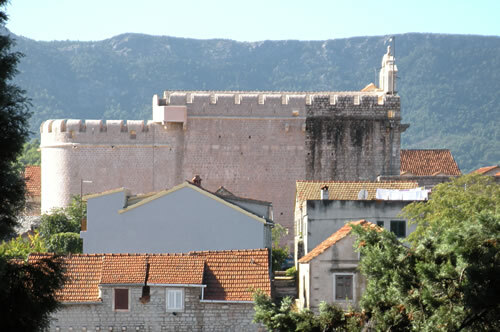 Moving further away, there’s another famous church fortress in Komiža, on the neighbouring island of Vis. 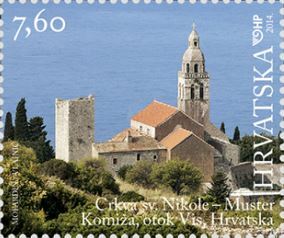 St Nicholas, also known as Muster, has appeared on a commemorative series of stamps issued last year by Hrvatska Pošta. 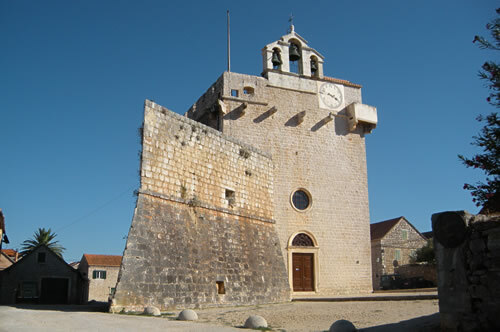 This is apparently the oldest example of its kind in Croatia, with two towers dating from the 13th century. From the view on the stamp, it looks very pretty, but when seen from the sea, you get a much better impression of what invaders would have faced, and how well defended this monastery really is! 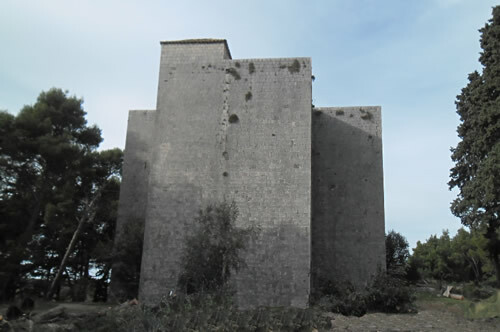 Another example from the Adriatic – on the island of Šipan, near Dubrovnik, the Church of the Holy Spirit (Sveti Duh) looks very slab-sided. Not even any windows in that back wall! 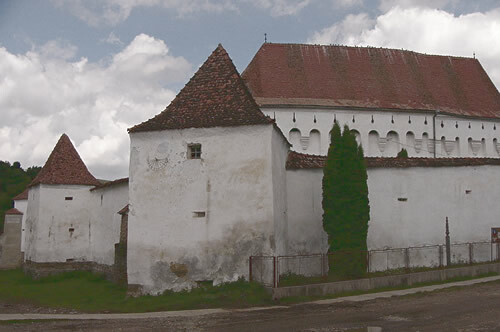 Translyvania, as it turns out, has several villages with fortified churches, seven of which have been designated as UNESCO protected historical sites. This is actually pretty impressive, a real fortress church! 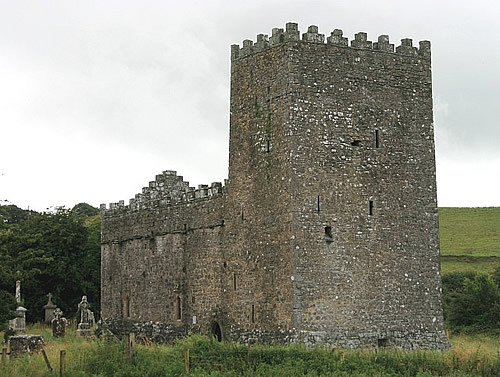 Even in England, there are a few examples of fortified churches near the Welsh and Scottish borders. In Ireland, too, you can find churches with battlements – this one has particularly stylish merlons for a very interesting roof-line! So, basically, it was pretty common practice in Europe during wartime to fortify the largest building in the village to be your place of refuge. Very sensible. How you went about that, and what fortifications were appropriate, depended very much on local circumstances. Vrboska’s church fortress has a lovely simplicity about it, and definitely adds a touch of drama to what is these days a peaceful little fishing harbour. And, of course, it’s comforting to know we have a place to hide when the pirates attack!